We’ve worked out a Parking Presale Agreement with the 101 Elliot Avenue Garage for Vendors, Sponsors, & Speakers. 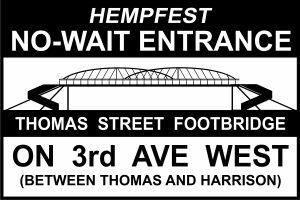 No more worrying about where you will park during Seattle Hempfest! The lot is right at the Seattle PI Ball and just a short walk from our Thomas Street Footbridge entrance which lets you into the park at Main Stage. You can purchase daily parking from 6 am – 10 PM for $50 per day Friday, Saturday, or Sunday. You can purchase all 3 days, which includes overnight parking, for $115 You can purchase just Friday or Saturday for $75 or just Saturday & Sunday for $75 too. Please note there is a small service fee added.